The Praz is part of the many villages that form the ski resort of Courchevel. At 1300 mtrs it's the perfect place for a family or friends' holiday in a typically savoyard environment. Courchevel is a quality ski resort located in the Tarentaise Valley, part of the Savoie region of the French Alps. It forms part of Les Trois Vallées, the largest linked ski area in the world and popular and highly recommended by the rich and famous. The resort boasts outstanding terrain, a very reliable snow record and picturesque ski in ski out villages. Courchevel is part of Les 3 Vallees the largest interlinked resorts in the world with 600 kilometres of endless marked trails plus unlimited off piste terrain. You could ski or snowboard Les 3 Vallees terrain for weeks and not cover it all. ‘Zen Zones’ or beginner improvement zones were introduced in the Courchevel Valley.The zones are located in 1850, 1650 and Le Praz were specifically designed for beginners and nervous skiers. The lifts are easy to access and the slopes are very well groomed and uncrowded. There are seven ski and snowboard schools in the Courchevel Valley with more than 650 instructors speaking 25 different languages. Lessons and packages are available for all ages and ability levels. The Courchevel Valley has four ski in ski out Villages all named after their altitudes; Courchevel 1850, Courchevel 1650 Courchevel 1550 and Courchevel 1300. Courchevel 1850 is the largest and most popular Village where the majority of accommodation, shops, restaurants and bars are located. Courchevel has more than 100+ shops with the majority located in the Courchevel 1850 Village. All four Courchevel Villages all have gourmet restaurants serving traditional local French Savoyard cuisine, Italian, Chinese and Spanish cuisine. Courchevel alone has 65 lifts and 102 runs, with a top vertical descent of more than 4,700 feet. 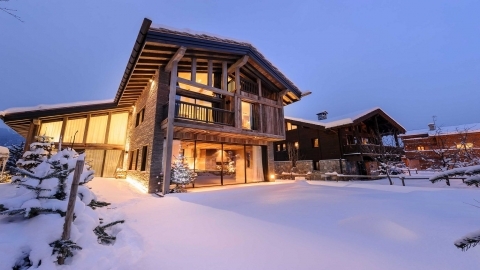 We offer the most exclusive ski chalets in Courchevel with indoor swimming pools and private spa facilities.